In December 2016, a trial excavation was conducted at 12 Balfour Street in Nahariyya (Permit No. A-7850; map ref. 20878–9/76789–90; Fig. 1). The excavation, on behalf of the Israel Antiquities Authority, was directed by P. Spivak, with the assistance of F. Abu Zidan (trial trenches), Y. Lerer (IAA sub-district supervision), N. Getzov (scientific guidance), D. Syon (metal detection), Y. Yaʽaqobi and B. Zidan (administration), R. Liran (surveying), A. Shapiro and N. Zak (plan) and H. Tahan-Rosen (pottery drawing). The excavation area was adjacent to the western fringes of Tel Nahariyya; the tell extends across a fairly large area, comprising remains from three main periods—the Bronze Age, Persian and Hellenistic (Yogev 1980; Amitzur, Be’eri and Getzov 2016). During the Persian period, the city stretched along the coastline from Nahal Gaʽaton in the north to Kaplan Street in the south and Remez Street in the east (Getzov 2014; see Fig. 1). 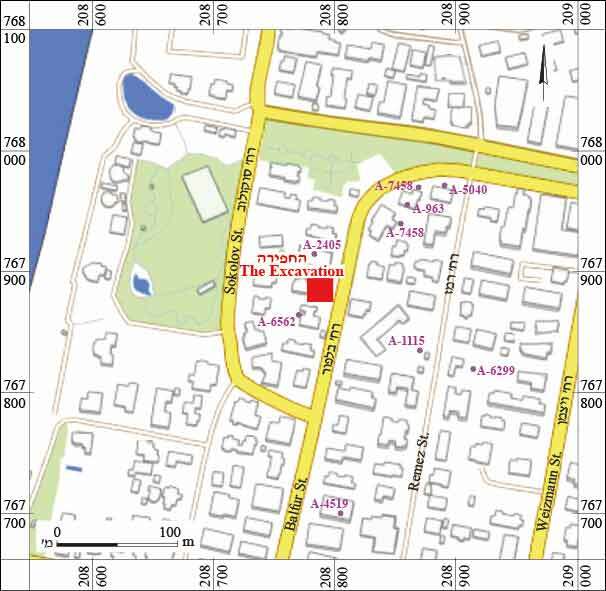 The boundaries of the Persian settlement can now be delineated with great accuracy, based on the numerous salvage excavations previously conducted in the area, in which remains from this period were documented (Lerer 2013, see references cited therein; Getzov 2014). 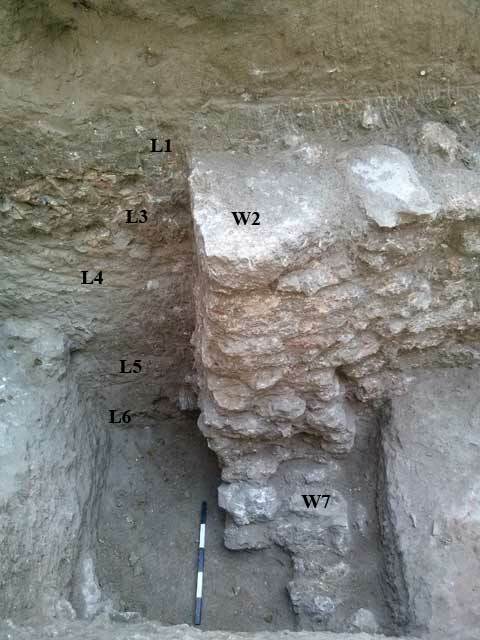 Three settlement strata consisting of building remains from the Persian period were documented. Remains of the material cultural from the Persian period, including built walls and a habitation level covered by a sand dune, were discovered in the current excavation at a depth of 2 m below the surface. No ancient remains were revealed in the trial trenches dug west of the excavation area prior to the field work. Stratum III. Two walls (W2, W7; Figs. 2, 3) built of limestone were exposed. The walls were initially part of a large structure that was probably oriented in a general north–south direction, parallel to the coastline. The walls seem to have been in use together only during this phase. Their foundations were not revealed. Stratum II. Wall 7 was canceled, and in its place, north of W2, was an earthen habitation level (L4) was instaled. An archaeological accumulation (L5) was identified between Strata II and I.
Stratum I. The upper part of W2, built of three new courses of large dressed stones, was constructed in the last phase. 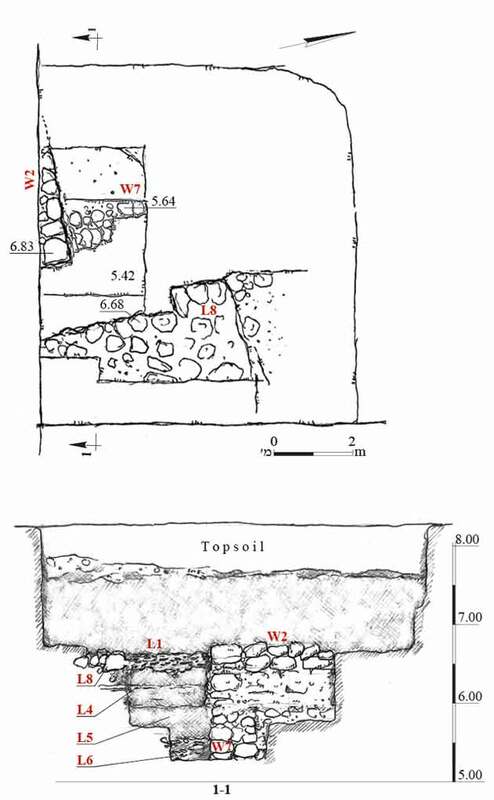 A layer of hard sediment (L1)—a mixture of sand and crumbled mudbrick material—covered the remains, and is probably indicative of mudbrick construction on top of the stone walls. The ceramic assemblage recovered from alongside the architectural remains is typical of a coastal settlement from the end of the Persian period. It includes moratoria (Fig. 4:1, 2), Phoenician jars (Fig. 4:3–6) and amphorae (Fig. 4:7). Also found were iron tools (Fig. 5:1), long iron and bronze nails with a square cross-section (Fig. 5:2) and other bronze objects (Fig. 5:4, 5). 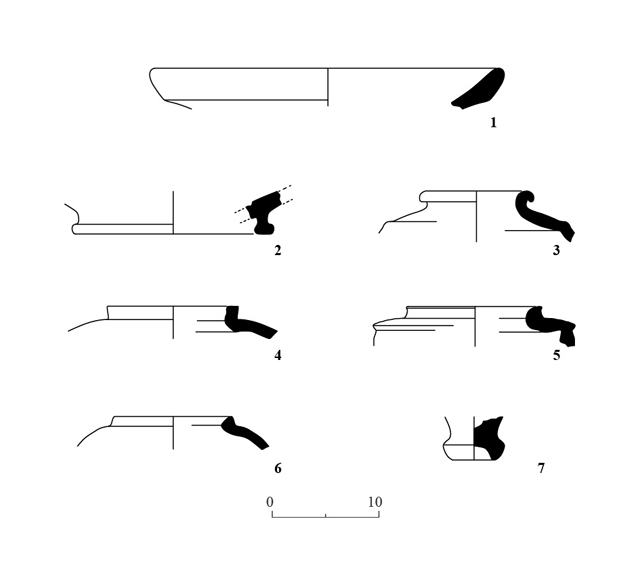 The finds from the current excavation together with those of the nearby excavations (Porat and Gal 1999; Lerer 2013; Fig. 1: A-2405, A-6562, respectively) mark the western boundary of the Persian settlement at Tel Nahariyya. Although this excavation was small in scale, its contribution to the study of the ancient Persian city on Tel Nahariyya is significant. The intensity of the three settlement strata and their fine state of preservation (more than 1.5 m of archaeological stratification) attest to the considerable effort that was invested in planning the high-quality massive construction along the settlement’s boundary. Amitzur Y., Be’eri R. and Getzov N. 2016. Tel Nahariyya. HA-ESI 128. Getzov N. 2014. Nahariyya and Mesad ʽEn Tamir – Two Fortified Buildings from the Middle Bronze Age in the Western Galilee. In M. Aviʽam ed. “From Watch Tower to Fortified City”: Forts and Fortresses in Northern Israel from the Canaanites to the IDF (Land of Galilee 3). Zemah. Pp. 11–19 (Hebrew). Lerer Y. 2013. Tel Nahariyya. HA-ESI 125. Porat L. and Gal Z. 1999. Nahariyya. ESI 19:7*–8*. Yogev O. 1980. Nahariyya. HA 74–75:8–9 (Hebrew). 3. The excavation area, looking south.